Today we gain an hour with daylight savings time (we fall ‘back’) an hour. Have you thought about what you will do with this extra hour? Todays ritual will help you claim even more time back. Most of the sunday rituals are adding something to help you grow. To provide more insight, self-awareness and personal growth. Today, though, I want to focus on less. Creating less noise and sending the sunday ritual hour, eliminating instead of creating. The rest of the article in interesting in how our clutter can affect the psyche. I, am very susceptible to this. When my physical space goes array, I literally feel it stress me out. When life is so busy and chaotic, with so much we can’t control, my physical space is one that I can and basically represents how I feel. If it's a mess, I feel like a mess. My poor boyfriend has to see the mental ramifications of a disorganized, cluttered place. Since its visual, it maybe easier to manage. But, what about our digital space? Now that we have so much online, in a cloud, on our phone and laptop, there’s still digital clutter. All clutter, mental, physical and digital lead to a ton of different negative effects; less efficient thinking; worse eating habits, poor mental health, etc. So let's tackle it shall we? The image on the right makes me CRINGE! But I was definitely one of those people for awhile. Minus, I don’t like the little red notification so would open but then have a ton unaddressed. I have 3 email accounts, my personal, her collectives and my yoga email. I need to try to keep at inbox 0 or everything will just get lost. I also need to to save time. Time is so valuable and trying to search or spend time searching through emails is unnecessary time wasted. I am focusing on simplifying everything and trying to add more minimalism in my life (friends who know me know this is hard). I’m even taking an online minimalism weekly challenge from Aja Edmond (highly recommend). I just know this will help me in all areas of my life. Do more, less guessing and more time for the things that matter. Expected time > 1 hour. All rituals are under an hour. Commit to one hour of inbox detox and then shut your laptop and enjoy your evening. This can be done while watching your fav show, listening to music, podcast, etc. as it is a fairly passive activity. Maybe less than an hour if your inbox is already under control, or, a full inbox detox may take a lot longer for you. This may seem like a overwhelming daunting task. That’s why I insist on just committing to one hour max. Put on a timer. This way, you will also be able to see how much you can detox in that hour which will be motivation to continue tackling it afterwards! Step 1. Open your email (duh). 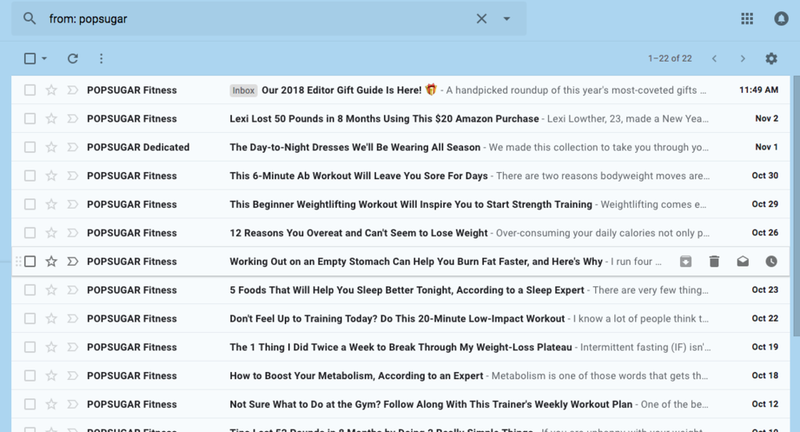 The goal is to bring your inbox to zero (or close to it) and only have emails that you must action (or read) in your inbox. See mine for her collectives. I have 5 emails I need to respond to. Step 2: Mass delete and unsubscribe. Let's get ruthless. What promotional emails do you get and never open or are interested in? Lets start with those and mass delete. For example, I picked popsugar fitness, I don't even know how I started getting these emails that I never open. Put from: and enter the email. Then, select (box top left and select all). Then, select the spam icon (! 2 over on the top, see right). Select Report Spam and unsubscribe. Google will unsubscribe all future messages as well. TADA! How many emails can you delete? Step 3: continue, continue, continue doing this. Emails you don’t want to unsubscribe, simply delete. Process of clearing out your inbox to get to zero. Google will automatically sort all the promotional emails. You can do this first then decide which promotional emails you want to continue to receive. But by filtering them into this tab, allows you to peruse and delete in mass without an important email missed. A couple folders to keep emails you don’t need to action, but you want to keep and search later. Keep your folders fairly lean and mean to help keep it simple. You can always search later or within the folder. Maybe professional (with career stuff); vacation (with trips, etc); finances. Something simple. slow but steady wins the zero inbox!